I’m very pleased to announce that a PCB, panel or complete DIY kit of this project is available to purchase from makesynthsnotwar.com. 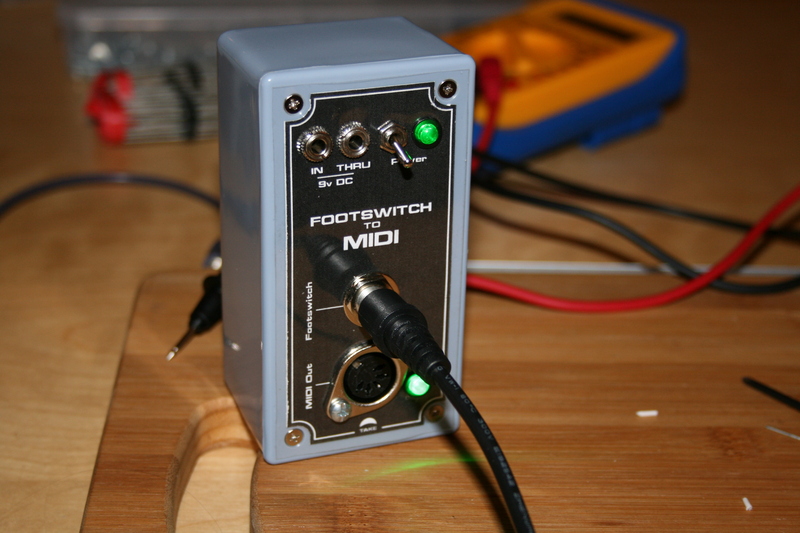 I’ve been dabbling with building my own bits of music tech recently. My mate Matt Steady gave me a nudge via Twitter to share what I’d been up to so here it is! 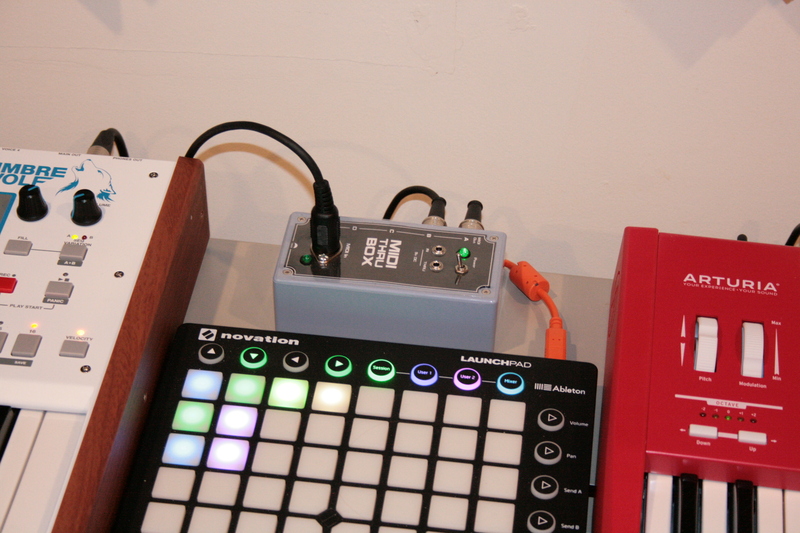 …and here’s where nearly all the answers came from, using an Arduino Nano as the key component. Along the way I built up a 5v power supply (so that I wouldn’t have to connect the Nano to a PC or USB charger) which proved really useful in the next project : a 1-in, 5-out MIDI Thru box (I was starting to struggle with the lack of thru’s on some of my kit, and with an expanding range of synths to keep clocked to Ableton, this was starting to get a bit challenging). 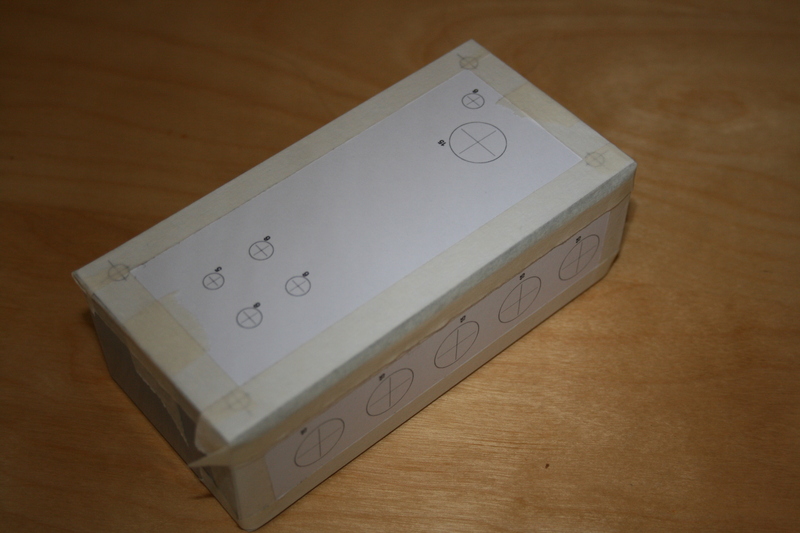 MIDI Thru boxes are surprisingly expensive, so I decided to keep the DIY roll going and build my own. You can find a circuit diagram (“schematic”) for pretty much any bit of tech that you want to build just by Googling for it. Reading a schematic isn’t hard (if you can read IKEA instructions, you can read a schematic) and there are lots of kits available for most things if you want to go that route in order to get started and get confident. You’ll need some skill with soldering (for “some skill” read “doesn’t actually set fire to things”; if you can achieve at least that, you’ll develop the skill you need as you go along). I decided to avoid kits as I’ve done a fair amount of soldering (mostly making up my own audio cables) and I did a fortnight of electronics at school 30 years ago. In my head, this makes me an expert, naturally. Also, kits are a bit more expensive and I’m very tightfisted. So anyway, a hunt around found me a couple of sources for suitable schematics here and here and a couple more hours of Googling put me in a position where I could decipher the symbols and match the diagram to the bill-of-materials. OK, so, once you’ve found a schematic or two and a list of the parts that you’ll need, you need to get that house in order so that you can start your build. Because your build, for one reason or another, is probably going to be unlike anyone else’s. You can get free software for drawing schematics – just Google it. 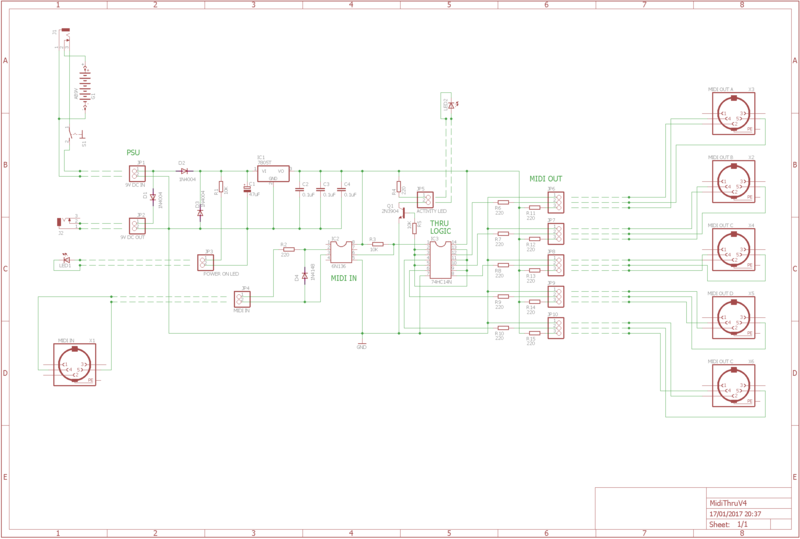 I used Eagle for this schematic, but I’ve since switched to TinyCAD as Eagle’s overkill for my needs at the moment and I find TinyCAD quicker to use. It took me a couple of goes to get to where I wanted to get but hey, you don’t DIY anything without expecting some learning-curves and time spent acquiring new skills (which, for me at least, is half the fun of DIY-ing anyway). To this I also needed to add 8- and 14-pin IC mounts, a project box, battery and prototype board, some hook-up wire and some DuPont sockets to match the headers. 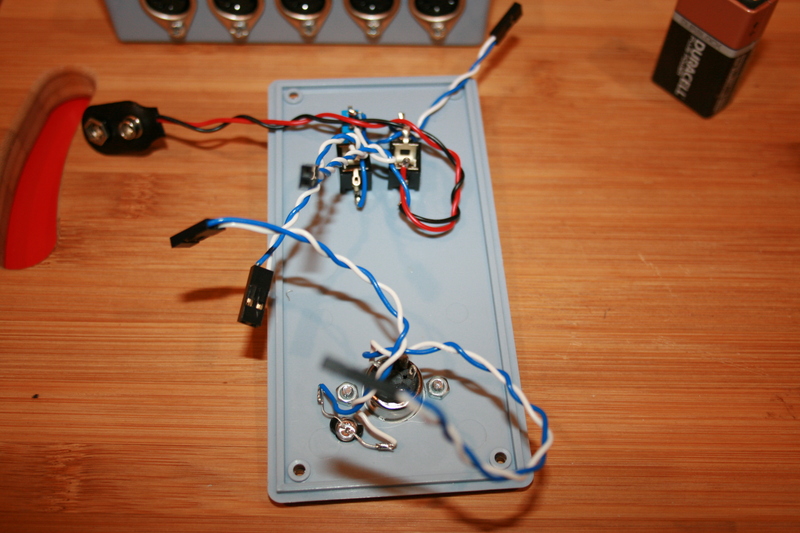 Note that the headers/sockets are optional, but I find it really useful to be able to wire the board and the box separately and then just plug everything in at the end. This bit is easy and a lot of fun. And there’s scope for spreadsheets and price comparisons. This appeals to my barely-buried inner geek. If you build a couple of things you’ll start to build stock really quickly; this is great but be sure to keep things bagged and labelled for easy identification in future. Go to your local pound shop and look for arts-and-crafts storage boxes for somewhere to keep all of your components. I’ve started using these guys and their sister site recently, as I’ve moved into building my own synth modules (but more of that in another, later and possibly even longer post). Let’s stop for a moment while we’re waiting for all those lovely parts to be dispatched and talk about tools. You’ll need some if you’re going to make your own stuff. I chose to build on stripboard (also known as VeroBoard). This stuff is cheap and comes in various sizes. You can cut it and shape it. 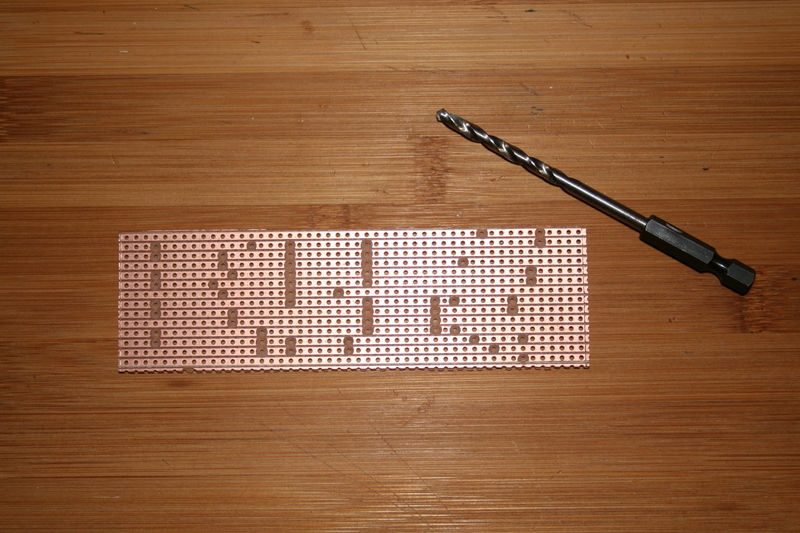 It has rows of copper tracks on the back that you use to connect your components to each other. Kind of like a half-way printed circuit board (PCB), only without the expense of buying a pre-made PCB or the grief of making your own. I’m cheap, is what I’m saying. This shows where all the components will go, where any breaks need to be cut in the tracks to create the circuit. The straight vertical lines are links between tracks. Cutting the board to size was easy. Just score the board with a craft knife then snap it along the score. Clean edges up with a file if you feel the need to. I find that scoring on the back (coppered) side of the board works best as you cut through the tracks at the same time as scoring, which leads to nice clean ends to the tracks. 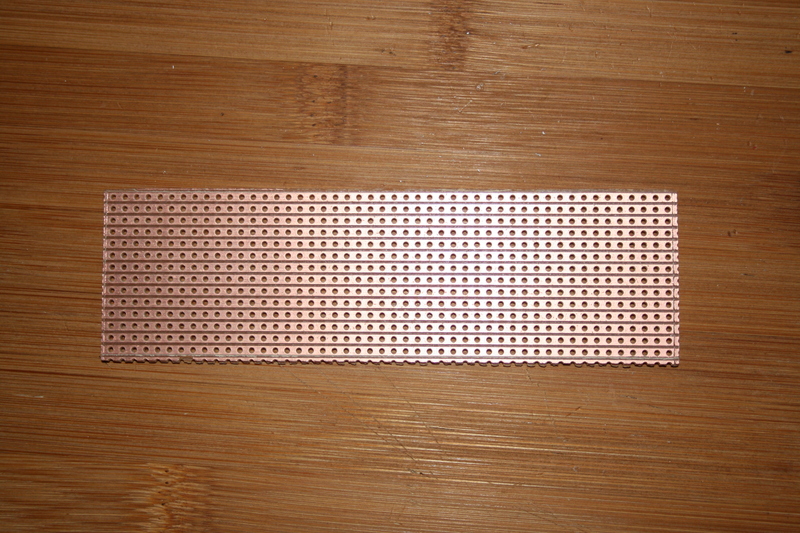 Before adding any components to the board, the first job is to cut any track breaks that are needed in the coppered side of the board. This is done using a drill bit. Use a hole as a guide and turn the bit by hand until the copper is cut right through. Remember that you’re working on the BACK of the board; I mirror-flipped my board layout image so that I’d have the right reference to work from. After you’re done, check that your breaks work – use the multimeter to make sure there’s no continuity across your breaks. Next thing to do is add all those links. 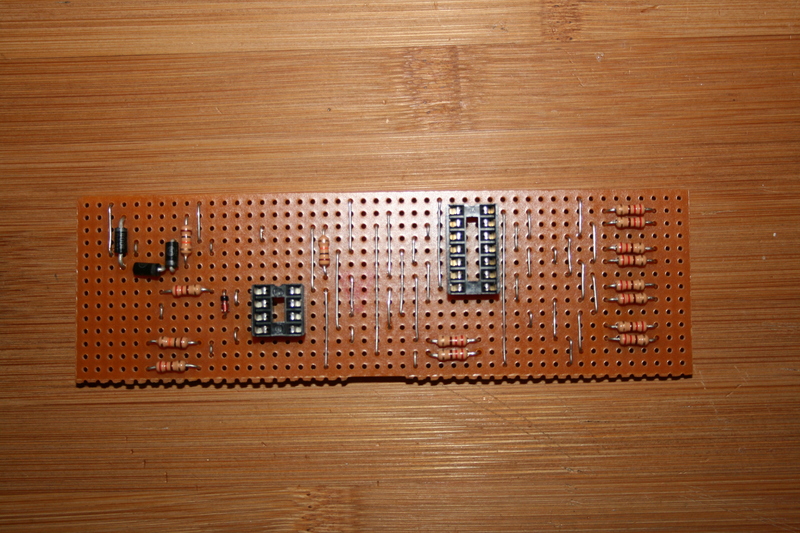 Flip the board over, place your links, flip it back and get soldering. You can use regular hookup wire or nickel-plated copper, which is what I’m using here. Either way, you’ll buy way more than you need. Links are easy to do when the board has nothing else on it. I find placing a paperweight (or a pair of wire-cutters) on the board helps hold the wire in place and keeps the board from moving while soldering. The wire will get hot so make sure you’re working on an expendable surface that’s not going to melt or burst into flames. 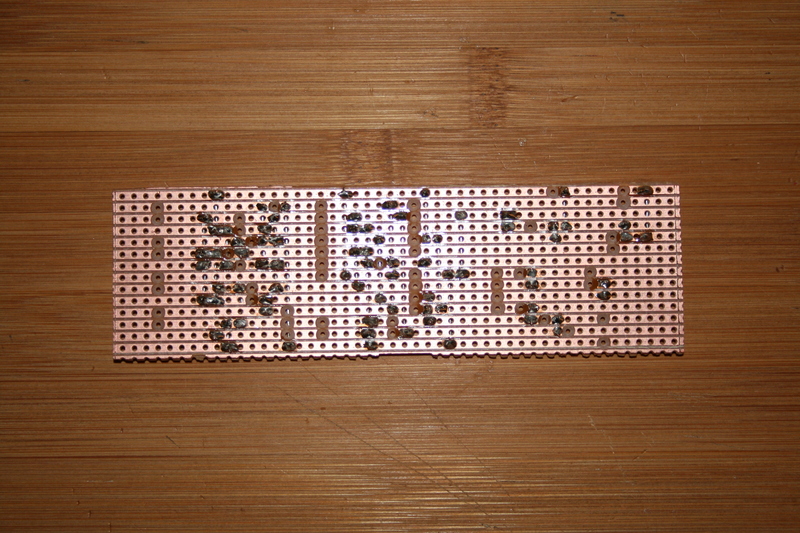 I’m not going to discuss how to solder as there are hundreds of existing websites and blog articles about that, but I will say that just filling a scrap of stripboard with links of various lengths is a great way to practice your soldering skills without using up any components. So now, add the components to the board. Work in height order, this helps to keep the board as flat and non-wobbly as possible while you’re working on it. Tick things off your diagram, schematic or BOM as you go along. Get components out only as and when they’re about to go on the board, and work with one value at a time. This helps avoid discovering that you’ve just soldered the wrong value resistor to your board. Make sure you check that polarised components (that is, things that have a positive pole and a negative pole) are the right way around. 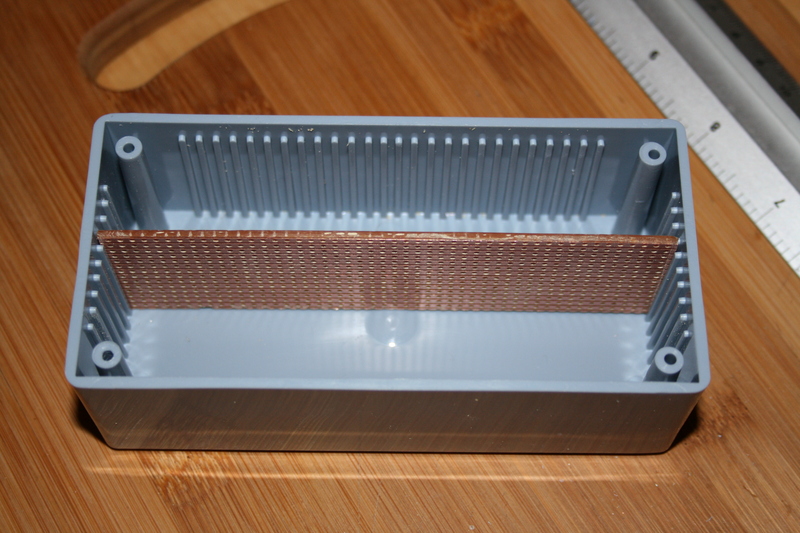 Snip away any excess wire after the solder has cooled. 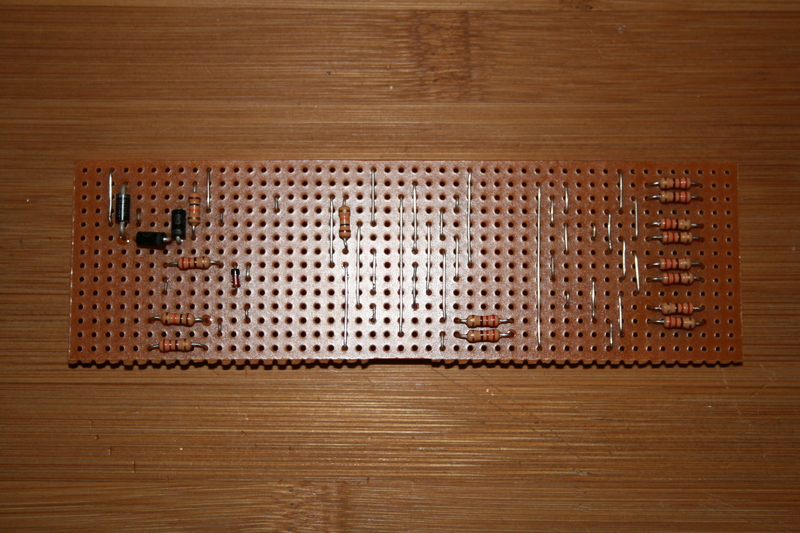 And so on, through capacitors, transistor, header pins, voltage regulator, until the board is built up. Last of all, carefully insert the ICs into their holders. So, with a board and a box and all my off-board bits-and-pieces ready, I next needed to mount everything into the box. I’d already planned out how I expected everything to fit. 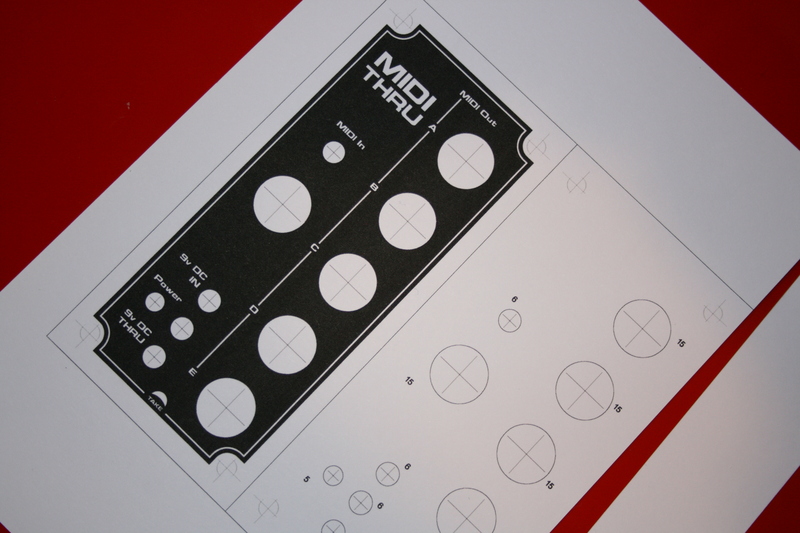 Next step – print out the panel design and test the plan. I drew the panel design in Photoshop and printed both the panel and a cutting guide for the holes. It was at this stage that I discovered that my spatial guesstimating had been a bit off and it wasn’t going to fit. Top tip: keeping the box closed while you drill it means that it catches all the mess for you. Always start drilling with your smallest available drill-bit; use this to put a small hole in the centre of each marked hole. Then use progressively larger bits to enlarge until you get the hole size that you want. After drilling, tidy the hole edges with a craft knife or hand-turned countersink bit (the plastic tends to melt a tiny bit around the drill, no matter how slowly you go at it). I cut out the panel design carefully with a craft knife. Actually, I used some masking tape to stick it to a piece of clear acetate first, then cut out the holes. That way, I ended up with a panel design and a matching clear, plastic overlay to protect it. I cut the acetate bigger all round than the printed panel; the screws at the corners of the box will hold the acetate in place. Both the acetate and the thin card that I’ve used to print my panels came from the local craft shop; £6 has set me up with a stock sufficient to make about 20-25 project box panels. Finally, I connected everything up and closed the box. Project done, for approximately £13-14. 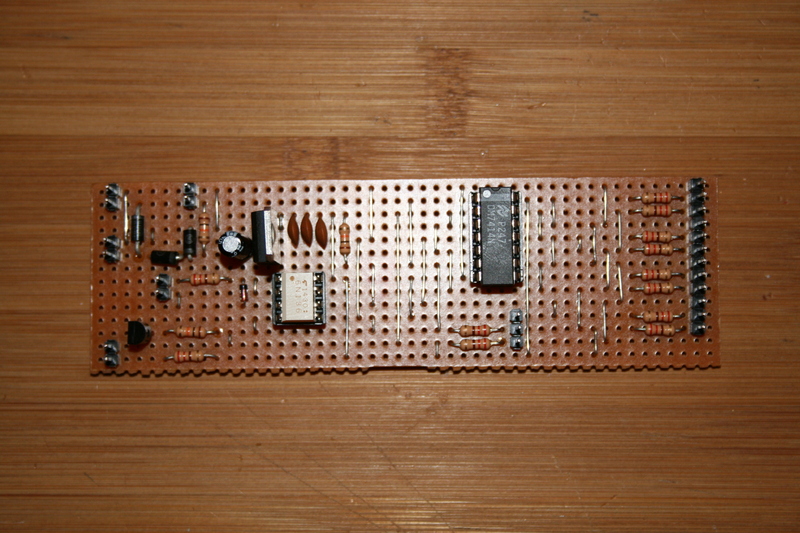 Building your own music electronics is well within the reach of most people, and can be both cheap and fun to do. The skills aren’t hard to acquire and there’s not really any specialist knowledge needed in order to get started. While it’s rewarding to understand fully what’s going on in your circuit, it’s not mandatory – if you can follow a recipe, you can build a circuit board. Hello, I am trying to build a box going from your specs. Only issue is I have no idea what voltage your two capacitors are. Can you please help, thankyou for your time and this great project. They’re 25v – hope your build works out for you! Are those mini-jack 9V jacks? I can’t quite tell. I’m usually more of a guitar than a synth guy, so I’m accustomed to working with 2.1mm jacks. I was planning on skipping the battery, so the switching property isn’t really necessary for me, right? 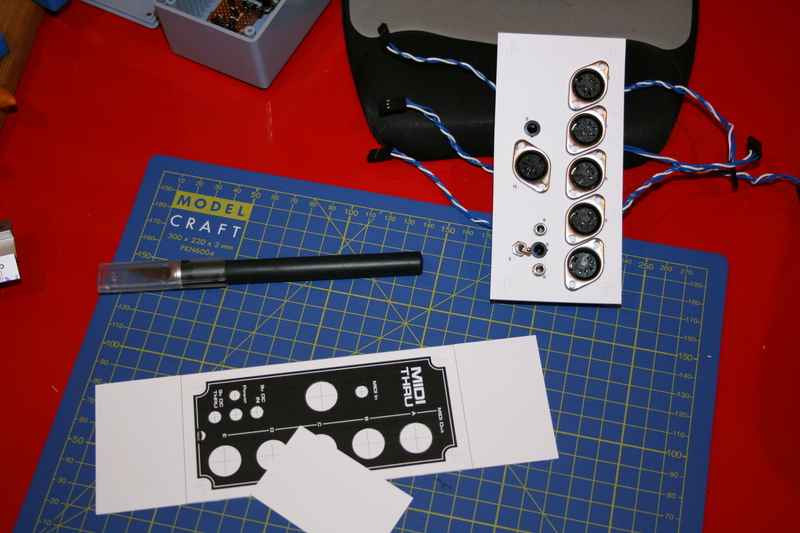 Hi – yeah, I use 3.5mm mono mini-jacks for my 9V power – mainly because, as a EuroRack Synth user, I’ve got loads of 3.5mm mono patch leads that are ideal for chaining various boxes together. You can, of course, use any jack you like as long as they’re suitable. The switch is entirely optional, as is the battery and the 9v output, too. 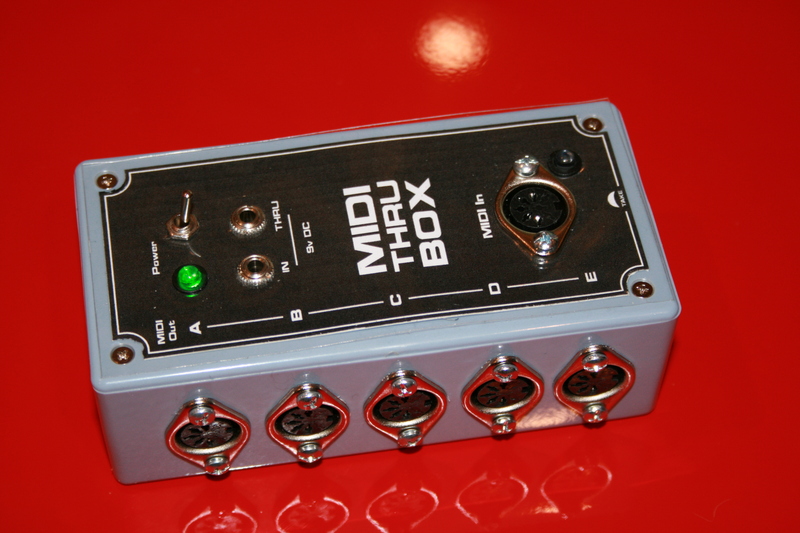 As long as 9 to 12v arrives at JP1, you can set your power interface up however you like. Hope this helps, and good luck with your build! Awesome. Thanks! And thanks as well for putting this together. It’s a very nice build and well-documented. Hi, great project, thanks for that. 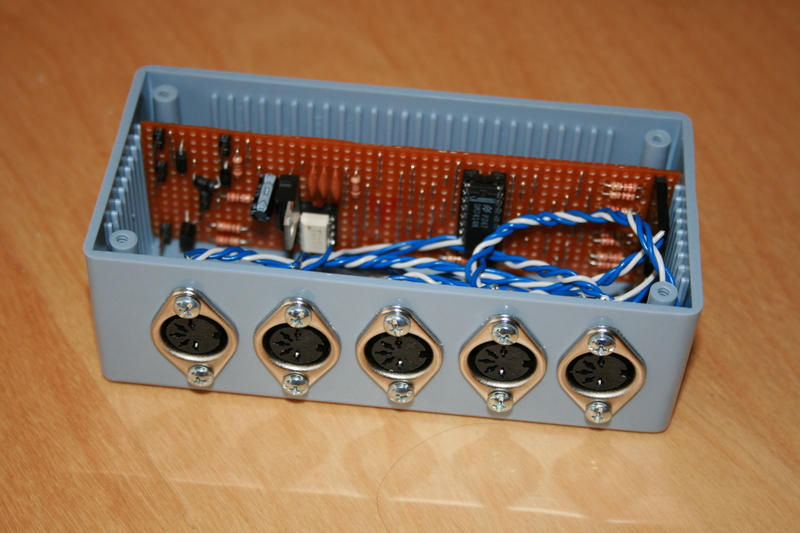 I would like to make one similar, but i need more outputs, (but i am not so good at electronics) is this possible to expand just by adding another 74HC14N+outputs or something else needs to be modified? Hi there – yes, I believe you can just add another 74HC14N to expand the outputs. Good luck! First of all, amazing guide, I’ve successfully built it by your design and am enjoying it as we speak! I have a question, though it might be stupid as hell, where did you get the metal rings to hold down the DIN connectors? I am more into electronics and less into the crafting so I’m not familiar of any official name for those parts. What parts would I need for making an enclosure such as the one you made? Hi Phil, glad your build has worked well for you! 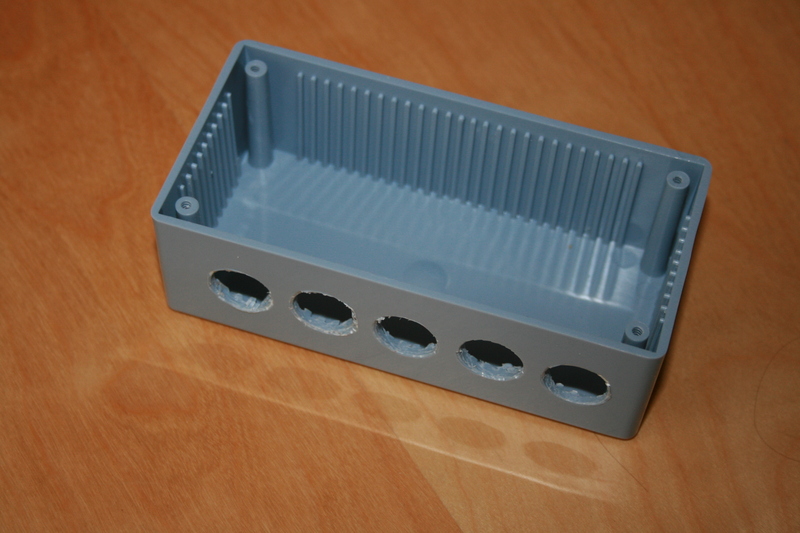 The enclosure shown came from Maplin and is made of grey ABS plastic. All you need in addition is a drill and some suitable bits. 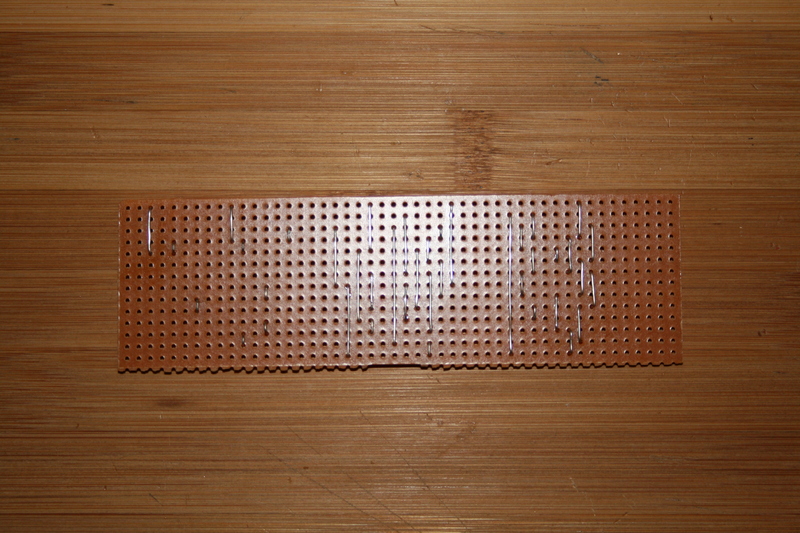 “Cone” or “step” bits are useful for large holes such as the ones for the DINs. This version of the project needs a bit more room to breathe, though – best bet is to pop to your local electronics hobbyist store (such as Maplin if you’re in the UK) and look at what they have – it’s better to choose an enclosure that’s a little roomy for your first effort.